South West Expo is set to return to Steam, Swindon for its 7th business show later this year. Organisers, Great British Expos have welcomed over 36,000 SMEs to their events since launching in Swindon in 2012, gaining the respect of the industry with repeat exhibitors and sponsors such as Barclays Bank, Lexus, Lloyds Bank, Just Cash Flow Plc and Vodafone. This year’s Expo will take place on Thursday 4th July, the event is free to attend, but you must register your attendance. For those wishing to exhibit, stands are available from £249 + VAT. The day will begin with a networking breakfast sponsored by Swindon Chamber of Commerce at 9am. A charity donation of £5 is required to attend the breakfast. The show will officially open at 10am with a day packed full of workshops, seminars and keynote speakers. South West Expo have announced BBC Dragons’ Den star, Edward Hollands as keynote speaker. Ed is the founder of DrivenMedia. He is an award-winning young entrepreneur, who is disrupting the UK’s traditional advertisement space after securing investment from TV dragon, Jenny Campbell. Internationally renowned entrepreneur and finance industry pioneer, John Davies will also take to the stage at the show. John has been involved in multiple businesses and is founder of Just Cash Flow Plc which is currently lending £1m a week to UK based SMEs. 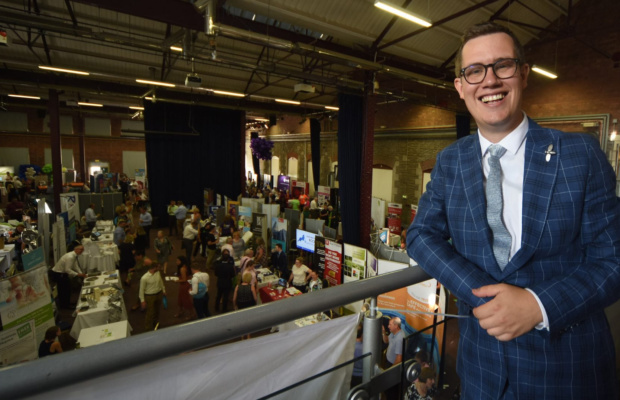 Alex Jones-Hall, director of South West Expo said, “The show will give you the opportunity to network, be inspired by our phenomenal keynote speakers and be informed by our industry-leading workshops to take your business to the next level. Over 130 exhibitors and 1300+ delegates are expected to attend this year’s show.